Rice cakes have literally exploded in popularity as a low calorie, low fat snack. Perhaps this is no coincidence—their production is based on the explosive characteristic of rice (and similar grains like popcorn) when heat and pressure are applied. Although they are considered a "new" and perhaps "high tech" snack, rice cakes have an ancient history and are made by simple processes that are both time-and capital-intensive. So, although producers may relish the pop, snap, and crackle, they fear the breakage that can result from even the slightest imbalance in the careful relationship of moisture, ingredients, time, and temperature that is essential to the production of rice cakes. The history of rice cakes is largely undocumented, but the general principle has existed for perhaps as long as rice has been harvested and relished for its nutritional benefits. Rice itself has been cultivated for more than 7,000 years. The 19 species of this member of the grass family grow best in warm, humid climates; and rice was probably cultivated first in Southern China or Northern Thailand. From Southeast Asia, its cultivation migrated all over the warmer parts of Asia, Southern Europe, and, eventually, the New World. Over half the human race now depends on rice as its main food and grain. As well as being a source of complex carbohydrates, rice has significant nutritional value. The bran (a layer between the grain and the husk that is removed in processing to make white rice and left in place in brown rice) contains fiber, oils, minerals, protein, and vitamins including E, K, and B-complex. Rice cakes in many variations are known in a number of countries. They are perhaps best known in Japan and the countries of the Pacific Rim where rice production is an economic staple and the grain is the basis for many meals and foods. Soft forms of rice cakes have been popular in Japan for hundreds of years. The rice cake called mochi was a sweet confection eaten by the nobility during the Nara Period from 710-794 A.D. when the Chinese greatly influenced Japanese culture. The popularity of rice cakes blossomed during the Kamakura Shogunate from 1192-1333. The variety of cakes included botamochi, yakimochi, and chimaki. During the Edo Period (when Tokyo became the capital of Japan during the Tokugawa Shogunate from 1601-1868), rice cakes became even more popular as treats for festivals and as local specialties. Rice cakes were commonly sold by roadside vendors, a tradition which continues in most of Asia where street vendors sell cakes made of rice and a range of vegetables, seaweed, and seafood. The vendors cook the cakes in hot oil before the buyer's eyes. 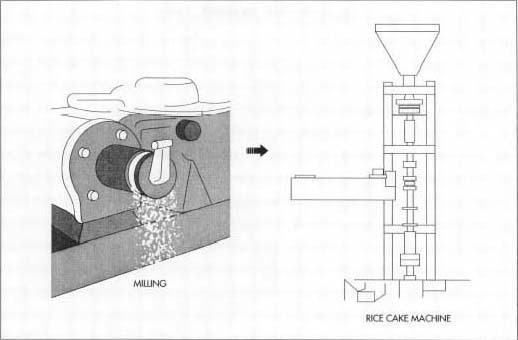 After the rice is milled, it is placed in a machine that molds it into cake forms. to the packaged rice cakes that are today's darlings of dieters and snackers. Rice cakes have only two critical ingredients—rice and water. The rice itself needs certain characteristics to produce the best quality cake and limit breakage. Sticky rice, whether white or brown, tends to work best, while long-grain varieties don't expand during cooking as vigorously. Water is important early in preparation. Other ingredients like salt (added before popping or sprayed on after) and various flavorings are important considerations to taste-and nutrition-conscious consumers but are not significant to the production process. Ease of production and marketability are major concerns when a new type of rice cake is considered. 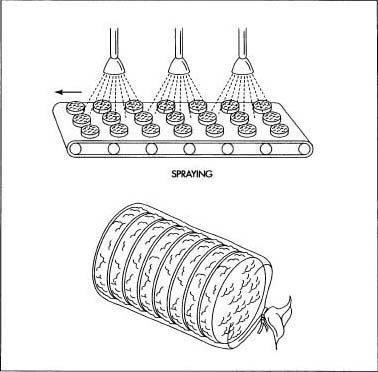 The popping machines are expensive investments, so the product must be readily adaptable to the machine. Production trials have shown that additives greatly increase the likelihood of breakage, so spices, herbs, and seeds are not mixed with the rice before the cake is made although they may be added to the surface later. Similarly, salt and flavorings are now sprayed on; earlier methods of adding them to the rice were less than successful in the survival rate of whole rice cakes and in taste. Some manufacturers have also eliminated mini rice cakes from their product line. The novelty of the smaller cakes was more costly to produce than sales warranted. A constant stream of new flavor possibilities and other options are under consideration, but only careful assurance of a contented public and minimal production difficulties justifies a new product line. The rice cakes are sprayed and packaged. will expand to fill a given space. The manufacturer's specifically preferred type of raw rice (depending on stickiness, expansion potential, and taste) is soaked in water until the right moisture level is attained. The moist rice is fed into hoppers above popping machines. A major producer of rice cakes may have 80 or 90 machines with one to three cooking heads, each of which produces one cake every 15 seconds. The rice is gravity-fed from the hopper into the cast-iron mold or cooking head in the popping machine. The mold is heated to hundreds of degrees, and a slide plate opens to impose a vacuum on the moist rice mass. After 8 to 10 seconds of exposure to heat at this pressure, the lid of the mold expands, creating an even greater vacuum on the contents. In the last few seconds of heating, the mixture explodes to fill the given space. If the rice forms a large proportion of the exploded mass, it will be more satisfying, have a better texture, and be full of natural flavor. "Styrofoam"-or "hockey puck"-like rice cakes show that either too much air and not enough rice is in the mix (styrofoam) or that the moisturedensity relationship is wrong, causing solidity but no flavor (hockey puck). Given the proper chemistry, the bran and other components of the rice bond to each other so the popped mixture sticks together without gumming additives. After the cake has exploded in the popping machine, the cooking head opens and the cake falls gently on a conveyor belt. The belt carries the cake past one or more spraying heads where salt may be added or the cakes are flavor-enhanced. Natural flavors are preferred by consumers and include everything from strawberry, caramel, apple cinnamon, blueberry, and almond to salsa, nacho, taco, salt-only, or Tamari seaweed. Some rice cake manufacturers will accept orders for private-label flavors. The conveyor, now carrying flavored cakes, passes through a tunnel dryer where the moisture added by the flavor sprayers is driven off. The conveyor moves to the bagging area, where the rice cakes are removed from the conveyor by hand, inspected for any breakage, and stacked, sealed in shrinkwrap, and packaged in an overwrap bag printed with the product identification and sealed. The bags are then packed in cartons for bulk sale. Quality control at the rice cake plant is a labor-intensive process. Any breakage means lost revenue, and maintenance of moisture levels and popping machines are critical. Moisture throughout the process and the factory is monitored constantly. The ambient (naturally occurring) humidity may alter production; on a dry day, more moisture may have to be added to the rice. The finished cakes will absorb moisture, but this is avoided by completing the process from popping machine to bagging in a few minutes. The popping machines themselves are cleaned every few hours. If the molds collect moisture or rice, the new cake will stick to the mold and become brittle and break. Because the cakes are individually hand-sorted prior to bagging, damaged rice cakes can be discarded before they reach a bag. Once they are ready for sale, the rice cakes have a remarkably long shelflife of over a year during which they retain taste and texture. If rice cakes have lost their crispness, they can be quickly revived at home by reheating them in a toaster. Even the freshest cakes benefit from a little heat that tends to restore their flavor. There is essentially no waste in the process of making rice cakes except for breakage. Enterprising producers have created markets for the broken cakes by selling them as cold cereal and ingredients in candy bars as well as bags of broken rice cakes for snacking. Flavors that fall out of fashion are removed from the product line and replaced by new flavors that are in development constantly. Chips, crackers, and other snack foods often provide flavor guidelines for rice cake makers. Increasing health consciousness bodes well for the future of rice cakes. As the treat has become popular as a snack, buyers have become more discriminating in rejecting Styrofoam/hockey puck products for those with better textures and flavors. The range of designer flavors offers something for every taste, and, of course, the consumer can top the rice cake of choice with fruit, peanut butter, or other enhancements to make an even more varied snack. In an age of energy, health, and time awareness, the 15-second rice cake seems to have harvested its long history. Lundberg Rice Paper. Lundberg Family Farms. Richvale, California. Foodland Industries MN Inc. http://www.foodlandmn.com . Kiso Lab, Shinshu University. http:/markus.cs.shinshu-u.ac.jp/ . Lundberg Family Farms. http://www.lundberg.com/ . Sweet Rice Cakes. http://www.ucsc.edullibrary/recipe/ricecake.html .